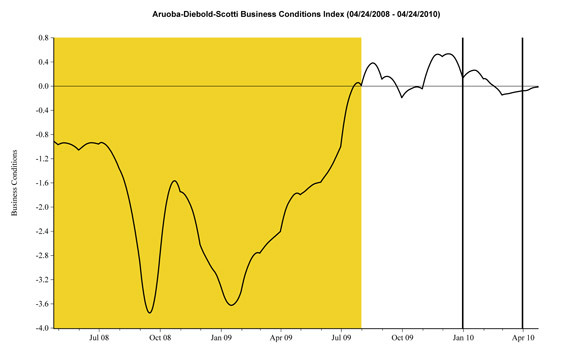 Here are four charts reflecting confidence from the SentimenTrader.com site. They provide a longer-term historical timeframe, which I have found to be rare. The above NFIB chart is particularly useful in conjunction with the April 15 post that discussed the latest NFIB results. This entry was posted in Uncategorized and tagged Consumer Confidence, small business on April 29, 2010 by Ted Kavadas. Traditionally, houses have been viewed as “hard assets.” However, as one can see above, their recent (from a long-term historical perspective) price pattern seems more geared to that of a “paper asset” – i.e. strong performance during the ’80s and ’90s, while significantly underperforming Gold for roughly 7 years. There are many other observations and interpretations that can be made from this ratio as well. It certainly “frames” home prices in a different light, especially from an investment standpoint. My previous posts on Gold can be found under the “Gold” tag. This entry was posted in Investor, Real Estate and tagged gold, Real Estate, residential real estate on April 28, 2010 by Ted Kavadas. 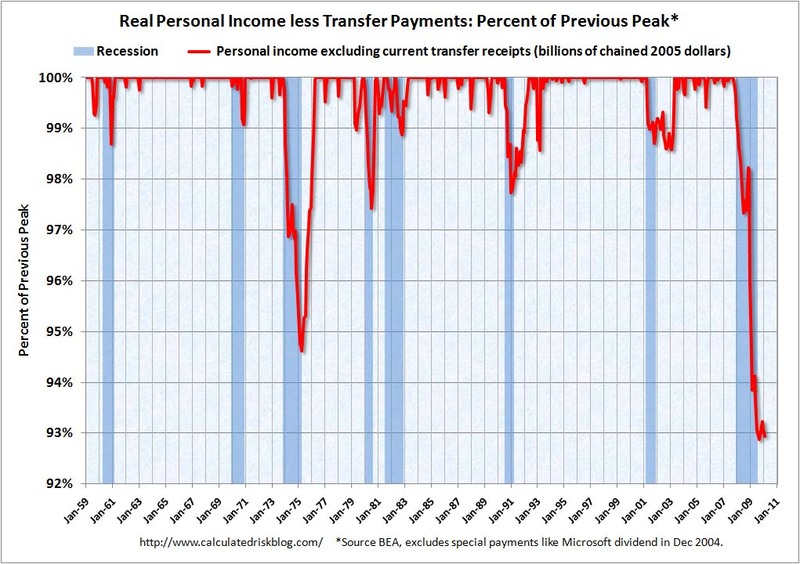 This entry was posted in Bubbles (Asset) and tagged Alan Greenspan, asset bubbles on April 26, 2010 by Ted Kavadas. Pricing is a very complex discipline even during periods of economic growth and stability. With the onset of increased economic uncertainty and volatility over the last few years, pricing’s complexity has significantly grown. Of course, it is impossible to characterize all firms as having the same pricing issues, as each industry and firm has a different set of circumstances. As well, any substantive discussion of pricing, especially in today’s economic environment, would be exceedingly lengthy and complex. However, there appears to be enough commonality among past and future pricing issues as to allow for some general comments. Many aspects of today’s economic environment are negatively impacting pricing and profitability. Among these are outsized excess capacity and generally weak, if any, revenue growth. As well, many firms are encountering customers unwilling, and/or unable, to pay previously acceptable prices. 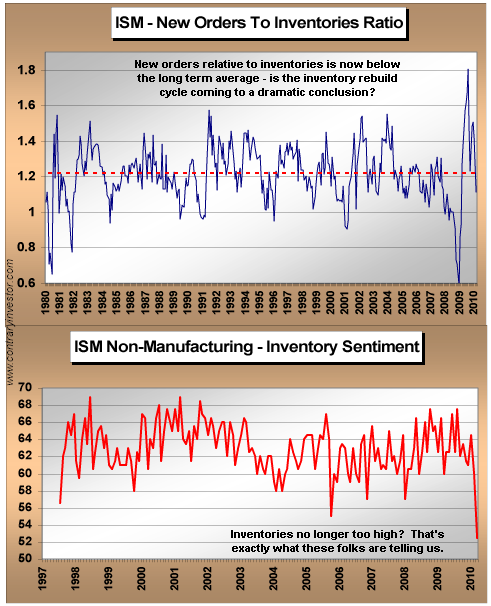 Inventory issues (mentioned in the last post), forecasting complexities (discussed in this article), and recent steadily increasing commodity costs further complicate the situation. While many larger firms have been reporting strong profits, much of this profitability has been attained through cost-cutting and other related measures. As such, it is not necessarily profitability derived through “pricing power” and increased gross margins. Many firms have responded to the current economic environment by reducing prices. Much of the heavy discounting and promotional activity appears rather indiscriminate in nature. Although cutting prices is perhaps the easiest way to attain revenues, this tactic likely holds even greater danger now than in the past. Gauging the effectiveness of pricing decisions is often complex, especially when viewed in a strategic sense encompassing multiple time horizons. While pricing decisions made now can appear proper, continued economic volatility and uncertainty can serve to undermine the effectiveness of such pricing. In essence, what may appear to be a proper pricing decision now may radically change with changing economic conditions. The odds of inadvertently managing a firm into some type of adverse pricing situation (or trap) like a “price war” or other various profitability-depleting scenarios is increased with greater economic uncertainty as well as customers who are increasingly price sensitive. Although the current economic environment holds significant peril for pricing and profitability, there is upside to the situation. Those firms that can effectively manage pricing in such an economic environment stand to gain significant competitive and strategic advantage across many different business functions – not to mention significantly increasing revenue and profitability when viewed against a scenario of ineffective pricing management. This entry was posted in Business and tagged Business, pricing on April 23, 2010 by Ted Kavadas. 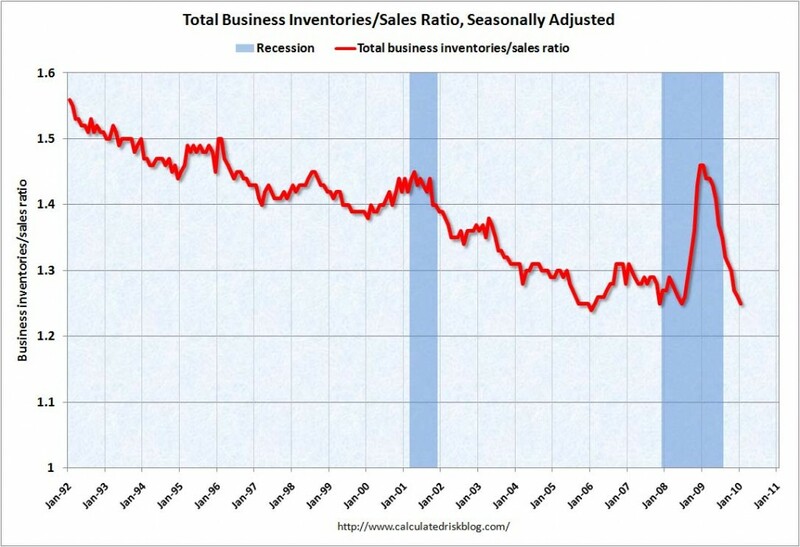 Another key question is whether current inventory levels are appropriate given the future sales environment. This entry was posted in Business, Uncategorized and tagged inventories on April 22, 2010 by Ted Kavadas. 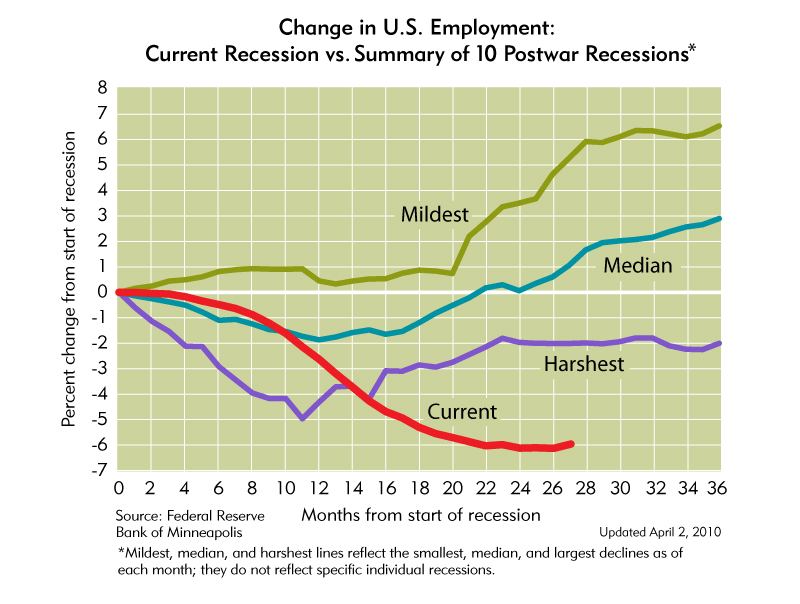 As an additional note to the last post, on April 12 the CalculatedRisk blog had an interesting post titled “Recession Measures.” In it, he discussed key measures that the NBER uses to determine recoveries. This entry was posted in Uncategorized and tagged "Double-Dip" recession, current economic situation on April 21, 2010 by Ted Kavadas. There are many noteworthy items in his article, and I could extensively comment on his arguments. Needless to say I disagree, fully or partially, on many of his points. I strongly disagree with this above statement. While there have been signs of “strong upward momentum” – as he suggests – there are also many signs of pronounced weakness, broadly seen across many measures. Various posts on this blog discuss these measures and weaknesses. 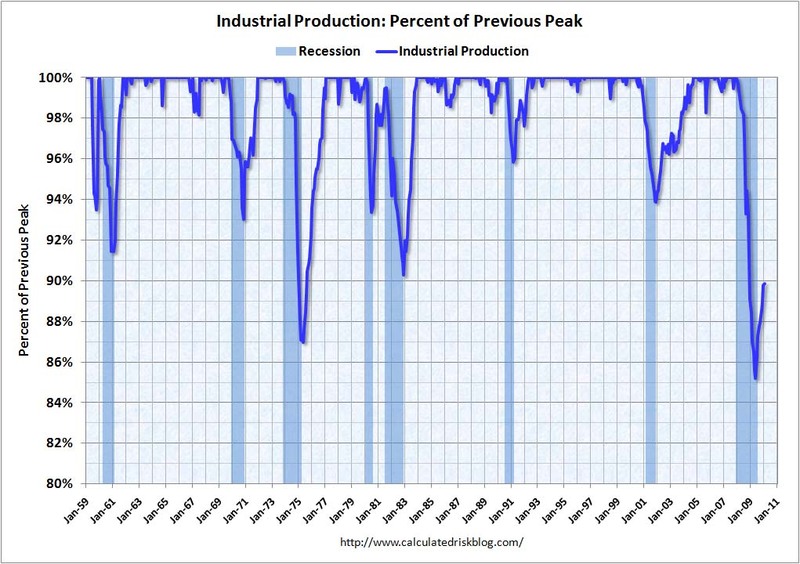 Those familiar with this blog know that I view this purported economic recovery as unsustainable, due to a variety of factors. Needless to say, I don’t agree, for a variety of reasons, with his two above assertions concerning the durability of economic growth. 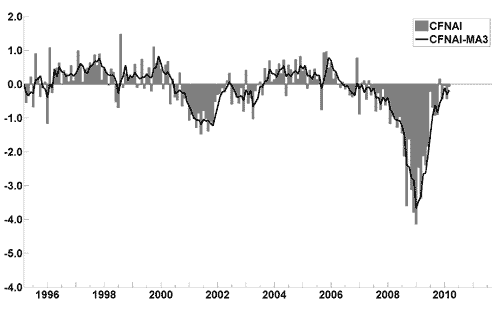 This entry was posted in Economic Forecasts and tagged "Double-Dip" recession, Economic Forecasts on April 19, 2010 by Ted Kavadas. 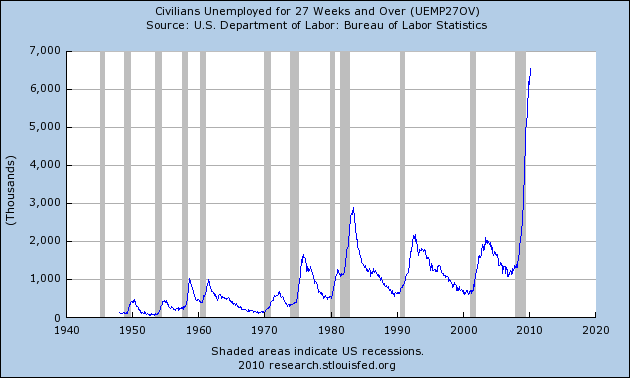 This post provides updated charts to the “Three Unemployment Charts” post of January 12. As I have commented previously, most notably in an October 6 post, in my opinion the official methodologies used to measure the various job loss and unemployment statistics do not provide an accurate depiction. However, I believe that the following charts provide an interesting perspective of the officially-stated employment situation from a long-term historical perspective. As depicted by these charts, our unemployment problem is severe. Unfortunately, there do not appear to be any “easy” solutions. 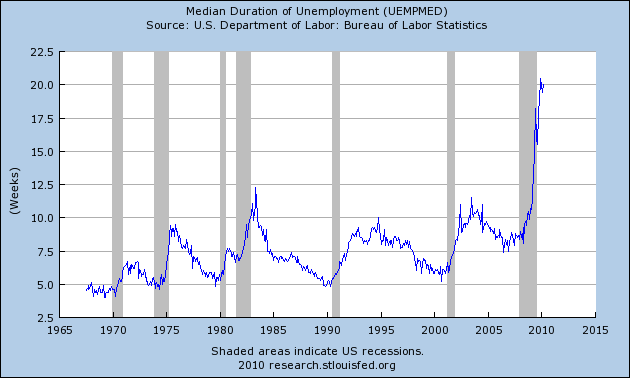 This entry was posted in Unemployment and tagged median duration of unemployment, Unemployment on April 18, 2010 by Ted Kavadas.